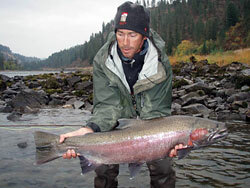 Nat grew up in a fishing family outside of Portland, Oregon, and started flyfishing at the age of 12. He worked as an outdoor educator for many years for Nols, guiding trips in Wyoming's Wind Rivers, Montana’s Beartooths, Alaska, and Chilean Patagonia. After graduating from the University of Montana, the Big Sky state remained as homebase until gravitating to the mountains and rivers of the Jackson Hole region. Nat now guides for FishtheFly on the Snake, Green, and many hidden backcountry creeks of the Gros Ventre Wilderness. In the winter months he can be found riding powder while guiding backcountry skiing in Grand Teton National Park. Contact Nat at natgraymurphy@gmail.com or 503-919-9974. 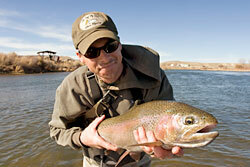 Krayfish is a Wyoming native and has worked in the fly fishing biz since he was 12 years old. Kray started in the fly shop but soon realized he had to be out on the water. When Krayfish first started guiding, the clients had to tow the boat because he was only 14 years old and didn’t have a driver’s license yet. “The fish” as he is affectionately called around the shop, has been guiding for 13 years now, and is a great guide as well as fisherman and can always have fun on the water. 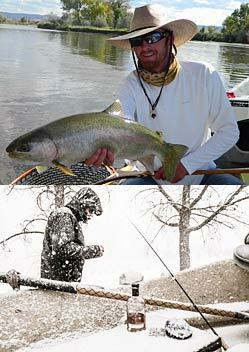 Now in his late 20s, Kray is one of the top guides on the North Platte and Wind Rivers in Wyoming. Kray is also one of my most requested guides and is a pleasure to fish with; his enthusiasm is contagious and he is always stoked to hit the river with friends and clients. The boy is super fishy and if he wasn’t always doubled up on the river I would probably fish around him more. To sum up, Kray was born into this, grew up with it, and now lives for it. 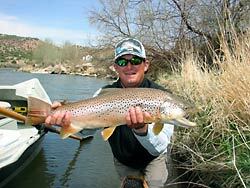 Contact Kray at the Platte River Fly Shop in Casper, WY or wyotroutbum@hotmail.com. P.S. Kray is a Scorpio that likes long walks on the beach, bubble baths and heavy set trout. My earliest childhood memories are of my father and my grandfather taking me fishing a lot. I blame them for my addiction; it's genetically unavoidable. 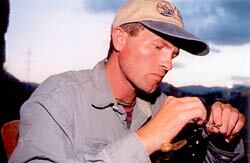 I started full-time professional guiding in South Lake Tahoe, CA in 1999, for Tahoe Flyfishing Outfitters. In 2007 I made the move to Victor, ID to guide for worldcastanglers.com. I have rowed a Clackacraft over a thousand days in ten years. Over the years, I've rowed other driftboats and nothing performs as well. Clackas surf better; they're lighter, have more storage and are just flat out better than any old or new driftboat on any river or pond. Chase is a 30 year old Oklahoma native living in the north Georgia mountains. He guides for Unicoi Outfitters in Helen, Georgia. He also works occasional overnight trips in western NC. He has been an FFF certified casting instructor for 7 years and continues working towards a master certification. Chase is known among his friends and family as a jack of all trades and a master of fun because he can keep grins intact even on a tough day of fishing. He is also known for pushing the "midge bite" on clients and making believers out of them. 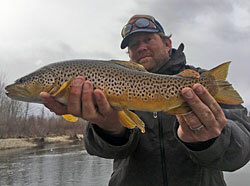 Favorite quote: "I got one"
Matt guides for Jackson Hole Anglers, as well as in the annual Jackson Hole One Fly Tournament, "a celebration of fly fishing dedicated to the betterment of trout and trout habitat." He also works as a full-time ski instructor for Jackson Hole Mountain Resort and as a senior-level instructor for the National Outdoor Leadership School (NOLS) in the off season. Matt recently earned his master's degree in Adventure Education from Prescott College and is an AMGA Certified Guide with fifteen years experience leading others in the outdoors. Matt's teaching skills, outdoor expertise and fishing knowledge allow him to effectively guide and educate beginners and experts alike. 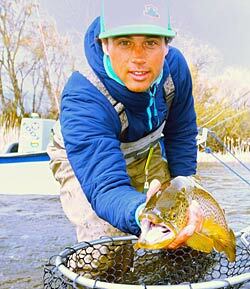 Matt is known for catching big fish among the guide community. Contact Matt at AbsoluteML@aol.com or 307-349-1312. Scott Smith, native to North Georgia has been kickin' around creeks and rivers his entire life and has drawn from that a level of understanding that has lead him to devote his life to the sport of flyfishing. "Guiding is my passion and I couldn't ask for a better hub and arena than Jackson Hole. "Scott is head guide for Jack Dennis and makes his "office" in the Clackacraft 15' LP, the perfect guide boat for every type water, big or small, fast or still. In the winter, Scott is top bootfitter at Pepi Stiegler Sports in Teton Village, Wy and when not skiing, he dreams of saltwater magic. Anndee grew up on the headwater of the North Platte River in Saratoga, Wyo. She has been fanatical about fishing and the outdoors since she was eleven years old, and the passion for fly fishing and guiding continues to grow. 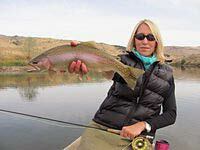 She currently owns Fly llc, a women’s guiding service, and designs clothing for women anglers. (www.fly-llc.com) She rows a pink and black 16 LP. She has spent many, many days on the river, not only with clients, but fishing on her own. There is nothing she would rather be doing than rowing her Clacka or fishing out of the front of it. Secret Spot: Quake Lake by the "dead tree!" 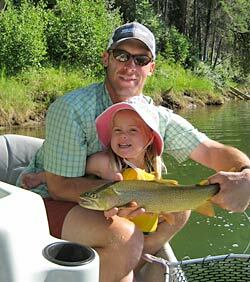 Erik began guiding for the family business, the Absorka Angler, in Cody, WY. In 1998 he began a full-time gig at the North Platte Lodge, making him one the first guides on the Grey Reef stretch of the North Platte. Thousands of days on the water and a strong work ethic make him an unquestionable authority on the North Platte. Co-owner of the North Platte Lodge and The Reef Fly Shop, Erik rows a 16LP with mountain driftboat oars. 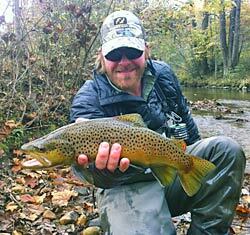 Trent found his passion for fly fishing while growing up on the gulf coast of Texas and Louisiana. He moved to Wyoming to earn a degree in Fisheries Biology at the University of Wyoming. 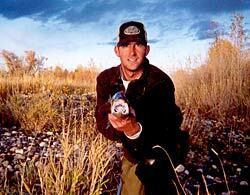 A member of the Scott pro-staff, Trent has spent 9 years guiding on the North Platte, from the Miracle Mile to Casper. 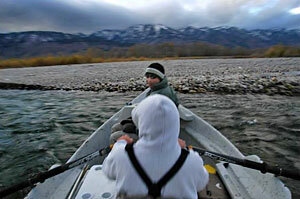 Co-owner of the North Platte Lodge and The Reef Fly Shop, Trent rows a 16LP with mountain driftboat oars. Rhett spends a lot of time in a driftboat. Rain, snow, cold ... no problem for Rhett. This has given Rhett a real insight to the habits of some very large trout. Rhett owns Reel Deal Anglers based in Jackson Hole, Wyoming. He has been guiding in the Rocky Mountains for 12 years and is presently guiding in Wyoming, Idaho, Montana and Argentina. Rhett's enthusiasm is contagious. After spending a day or week on the river with Rhett, you will realize why his clients return year after year. You can check out his web site at www.reeldealanglers.com. Isn't this one of the biggest browns you have ever seen? Will caught this fish on the North Platte. Will guides on the North Platte in the spring and then moves up to Jackson Hole in the summer and fall and guides on the Snake and South Fork. 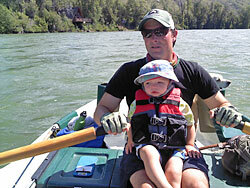 Will uses ClackaCrafts 16lp andthe new Mountain Driftboat Oar. 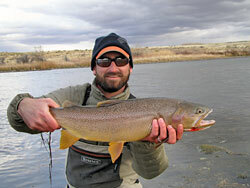 If you want to fish with one of Wyoming's and Idaho's top guides, contact Will Frohlich at cutthroatfro@yahoo.com.